Today we’ll be doing another quick shrimp skillet for those looking for a healthy weeknight meal. It’s zesty, it’s full of life. And dee-licious. Once I started sneaking a few in between shots, I couldn’t stop. 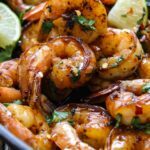 It’s infused with the freshness of cilantro and lime, a little feistyness from sprinkles of red pepper flakes and marinated lovingly in a honey garlic sauce. And if you love the sauce, you’ll get to drizzle more of it on later. And maybe more lime juice. Because I have to say the lime juice was the star of the show for me. Now if you want, you can even skewer these and grill them. But for those that want to stay in front of the stove or have an aversion to sharp pointy objects, skillet this away! I’m doing this on a cast iron skillet so there’s caramelized bits from the honey we can rub the shrimp into later to give it a blackened, smoky look. And if you want it smokier, feel free to sprinkle some smoked paprika into the sauce. We start by chopping up whatever needs to be chopped up. Then make your sauce. It’s super easy. Add as much red pepper flakes or cayenne as you want. It can be as hot as you like or don’t like it. Just tailor it to your taste buds or the tastes buds of the most vocal member of your family at the table. That way, everyone is happy. 😉 I went with large peeled and deveined shrimp with the tail on for looks, but you can go tail off or even go for jumbo shrimp. 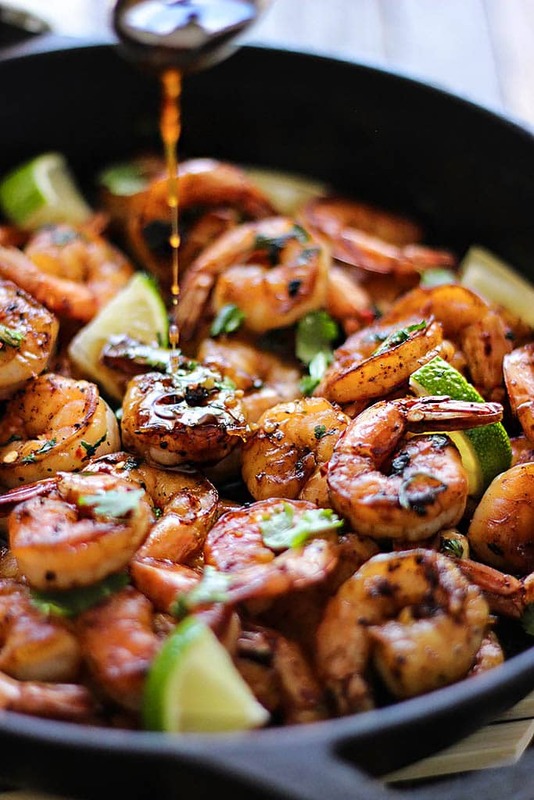 Marinate the shrimp in half the sauce for 15-30 minutes. By now, you’ll be infused with a breath of fresh cilantro so you should be in a good mood during this idle time. Then we heat up the skillet over medium high heat and start cooking the shrimp. 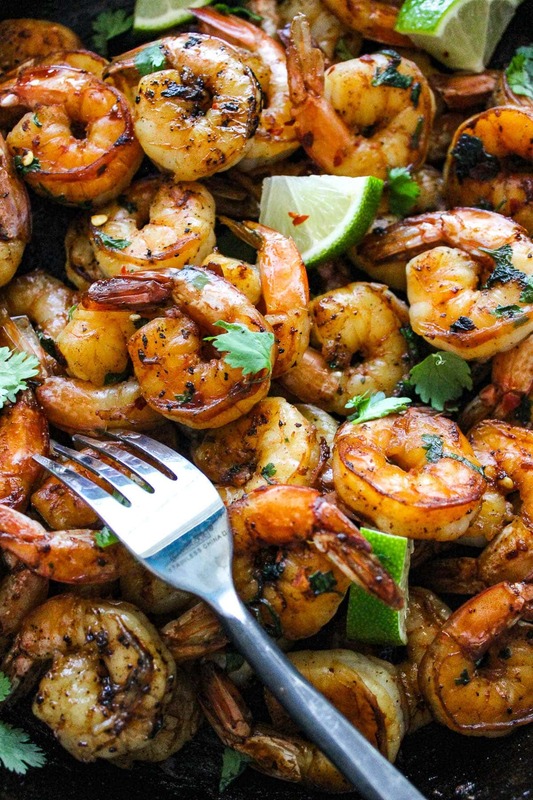 Discard the marinade and cook your shrimp in batches. It won’t take too long, about 1 minute per side. 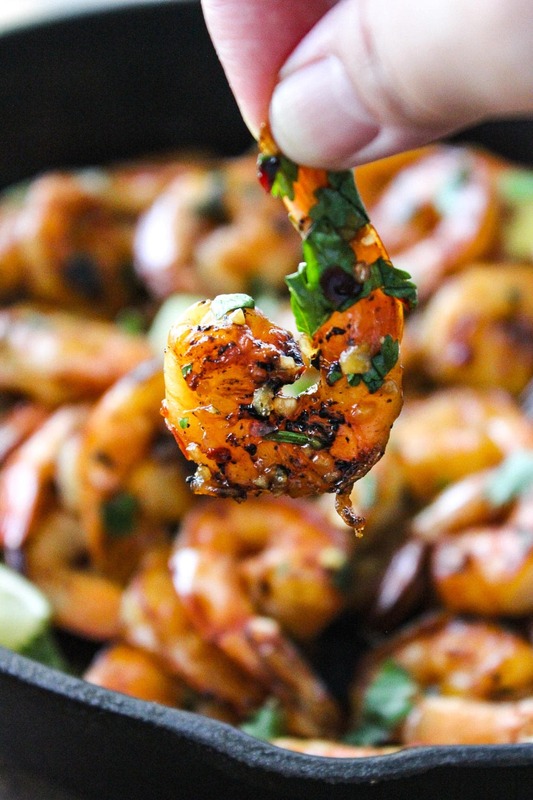 Just be sure not to overcrowd the pan so the shrimp doesn’t steam instead of sear. Give it some room to breathe. Then rub it into any caramelized bits with your tongs in between batches to get it nice and blackened. Once that’s all done, you’re ready to serve. Now you can drizzle with the remaining sauce as is, thicken the sauce over the stove top with a cornstarch slurry if you want it slightly more concentrated in flavor or double the sauce if you want more to go around. It all depends on how you like it. I’ve kept it a simple drizzle of the remaining sauce for now but feel free to adjust. And that’s it! Sprinkle with more lime juice and top with more cilantro if you want and serve. Yes you can, but use a lot less for ground since as a general rule it’s more concentrated than fresh stuff. I would substitute 1/8 teaspoon ground ginger for this recipe. Good luck, Donna! I’m soooo glad I found your site!!!!! I’ve saved so many of your recipes that I have to reload my printer paper again!!!!! Every one of them seems custom picked for my family!!!! Thank you so much!!!! I’m looking forward to more recipes from you. That’s so awesome that we seem to have the same taste buds. You’re most welcome and I hope you enjoy the recipes! 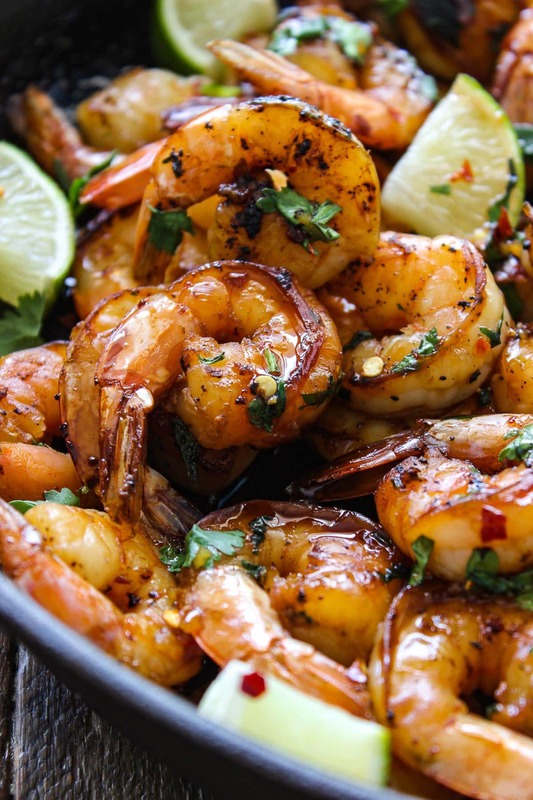 We love shrimp so always looking for new recipes! Thanks for the inspiration! My husband made this last night and we all cleaned our plates. We served it with Lime Cilantro Rice and Mixed Vegetables. 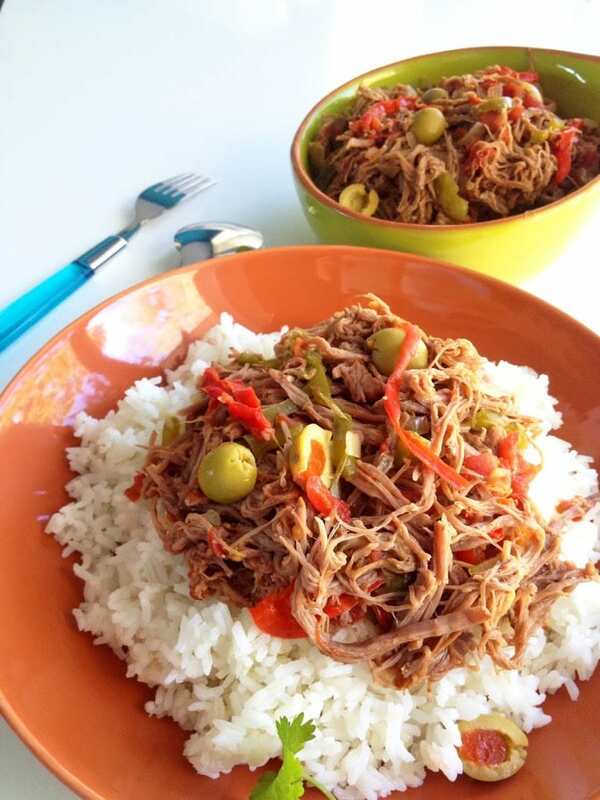 It was delicious and easy–the best kind of recipe! I made this dish last night for my husband and I it was amazing I put it over Spanish rice YUM!!! I’m glad the ground ginger substitution worked out for you, Donna! Spanish rice is an excellent side to go with it too! I am especially delighted that you have a “basic” recipe. You also use it with chicken ànd, buy just by adding some ingredients (and not changing the rest),you get another recipe. Very nice indeed !! The honey garlic series is a good staple, although I would say this is my favorite variation of it Loooove lime! Can this be frozen? It would be lovely if I can prep it for a week’s meal. I’m not entirely sure, Mas. 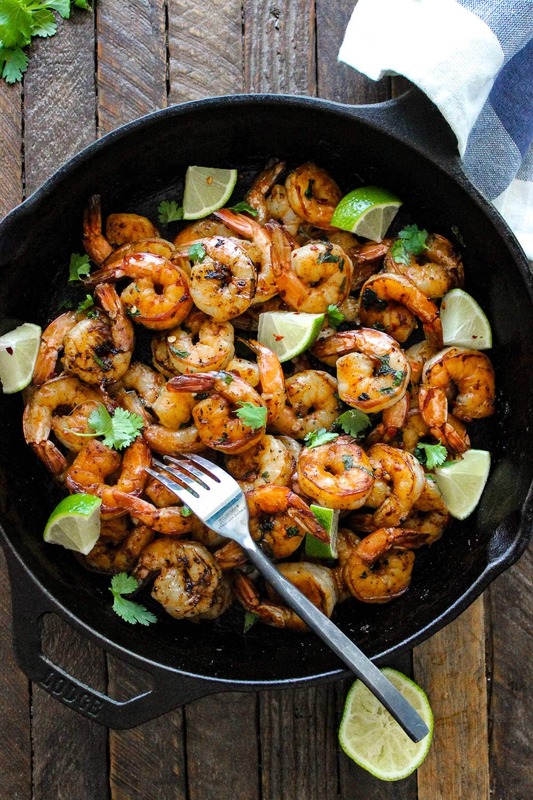 The shrimp might end up mushy if frozen and the acidity in the lime will make it even mushier. If you do decide to try it, let me know how it turned out? So good. The first time I made them I didn’t even notice you did them in a skillet. LOL I was going to grill that day and thought this would be perfect. My hubby loves it. I made it again tonight. Next time, I’m going to stir fry them in my wok with fresh lime wedges.